I often talk about a sleep deficit when giving advice for sleeping. The idea of sleep deficit comes from the book Healthy Sleep Habits, Happy Child written by Marc Weissbluth, M.D. What is a Sleep Deficit? A sleep deficit is what happens when your child doesn’t get enough sleep. Sleep deficits grow over time. Just like if you owe money and you are paying interest each month and the amount you owe grows, if your child continually gets less sleep than is ideal, the deficit grows. A sleep deficit is when your child isn’t getting enough sleep and the effects add up over time. What happens if there is a sleep deficit? When your child has a sleep deficit, your child is not getting enough sleep. If the sleep stays the same each day (or less), then the deficit will only grow. “…there is a progressive worsening in a child’s mood and performance even when the amount of lost sleep each day or night is constant” (page 116). This is why when you make a change in sleep, it can take a couple of weeks before you see the negative effects from that sleep change. Any time you have a sleep problem, look at the last couple of weeks and consider what has changed. “A constant small deficit in sleep produces a cumulative reduction in daytime alertness” (page 116). If your child is not getting enough sleep, your child will become less alert, more grumpy, more needy, and have a harder time sleeping over time. Remember, sleep begets sleep. Overly tired children have a hard time sleeping. As Weissbluth says, it isn’t logical but it is biological (see page 229). What does sleep deficit mean in real-life application? A sleep deficit is something to watch out for when sleep changes ever. This is especially true when dropping naps. I see it most often when dropping the morning nap. That transition time is hard, and people sometimes move to just one nap a day sooner than is best for the child and things backfire. Like Weissbluth says, sleep deficits accumulate over time. You might drop to one nap and have it be great for a few days, then things get a little muddled, and two weeks later you have a 16 month old taking a one hour nap total each day. If you have recently dropped a nap and your child starts to have napping problems, consider the possibility that your child is not getting enough sleep and a sleep deficit has grown. Your child wakes up grumpy. “Upon awakening, well-rested children are in good cheer and are able to play by themselves” (page 116). Do note, however, that most newborns wake up crying. It takes several months before you can expect a baby to start waking up happy consistently–probably around 4-6 months old. Your child has a hard time falling asleep. Your child takes short naps. Your child wake early in the morning. Your child’s behavior is worsening. When you explain a situation to me and I say I think there is a sleep deficit going on, it means that I think it sounds like your child isn’t getting enough sleep overall and is starting to have negative impact from the lack of sleep. You need to figure out a way to get your child having more sleep in a 24 hour period. This means you need to figure out why your child isn’t getting the sleep she needs. You might need to add in a nap. You might need to start the nap earlier in the day. You might need to have an earlier bedtime. You might even need more physical exercise and stimulation each day. Be sure to look through my Index of Sleep Problems for a lot of posts that will help you brainstorm. 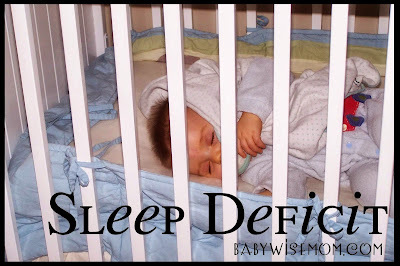 Hi Valerie, I found this post really interesting as I've been wondering if a sleep deficit applies to my 10 month old. He used to wake up happy consistently from when he was about 3-4 months old but lately he has been waking up and crying (sometimes quite hysterically). This has been going on for about a month. I've always thought he is a 'low sleep needs' baby as his total daily sleep is always at the lower end of what is normal for his age. At the moment he takes 2 naps, about 1.5 hours each and sleeps about 10 hours at night, usually up for the day between 6-6:30. This has been pretty consistent for the past couple of months now. I have tried moving bedtime earlier by 15 minutes to see if that will help him sleep later in the morning but it is kind of hit and miss. Do you think waking up crying could be related to separation anxiety? As soon as he wakes up, he sits up in his crib and crawls over to the corner closes to the door and appears to be looking for company. As soon as I go in to get him he usually settles down pretty quickly. I just thought it was unusual for it to have gone on for as long as it has. It's kind of sad that he wakes up unhappy every single time and I miss him waking up happy and contented. Any advice would be appreciated! It is possible it could be some sort or anxiety. Is there anything that changed around the time he started waking crying? Have you tried putting a safe stuffed animal in with him or some sort of lovey? Thanks for the response, I really appreciate it 🙂 We did go on an overseas holiday for 3 weeks and when we came back he had a hard time re-adjusting for about a week. I think it was a combination of the time difference and developmental phase (crawling, standing..). This was nearly 2 months ago now. His sleep now is good and the most consistent it has been. I have tried giving him a little stuffed teddy when he sleeps but he doesn't seem to show any affinity to it. It kind of just sits in his cot now. What are your thoughts on playing with him in his cot? I thought I might do that when he wakes up instead of picking him up straight away to try to associate wake up time with happy time. I wasn't sure if that would give him the wrong idea about the cot being a sleep space though? My son would sleep thru most nights until 6.5 mo. He began waking and crying every 2-3 hours. I would change him and or nurse in my room then put back in crib (once already asleep). Two months later he only sleeps about 9 hours a day total. I realize this does not seem like enough. I am recommended your page, I come cross this page and others. I realize I am swooping in too early! Last night I let him CIO each time he woke. 1st time 5 mins, 2nd time 15 mins, 3rd time 5 mins. Never had to go I there, he fell back asleep. I set limits with myself to help ease my stress abouth crying: if he stands or cries for more than 20 I'll go in. I almost caved on the 15 min one but he was laying down the whole time so I held strong. Thanks for your wealth of info! It helps! That is so great to hear! Thank you for sharing. I am glad you are seeing improvements. Hi Valerie, I know my daughter is sleep deprived because she's only about 5hrs sleep in 24hrs. But I just don't know what needs to be fixed. My daughter is 5wk old. Up to now, when I lay her down to nap, I'd have to get her asleep in my arms, then after 10min of supposed sleep she'd cry & I'd go in to pat at 10min intervals. It might take 2-3 times going in then she would sleep well the rest of the nap. The exception was after the 9:30pm feed/wake, then she would cry the whole nap without sleep. Four days ago she started not gaining weight each day. Yesterday after the 12:30PM feed/wake, she didn't sleep at all and this continued for the rest of the feedings until 12:30AM where she slept. We thought maybe it was a growth spurt. So today we fed her every 2hrs. She slept after the 1st feed/wake but then she has gone back to mostly no sleep. She did gain weight today but this girl just won't sleep. Am I missing something? Is she just refusing to sleep because I need to give the CIO more time since she will sleep being held? My husband is so frustrated that he said he's given up. I need help with this one. We have twin boys also & we need some peace to handle everything. Thanks in advance for any advice. Does she have reflux or gas pains? Thanks for the quick reply. After rereading the book again, we inclined her bed. This has helped. I'm now working on getting better burps too. We've started making detailed notes on her crying & sleep so we can see if there's a pattern. While the dr says she doesn't have reflux, I think she has some similar pains from the spitup. I also think now, that maybe feeding her more during the supposed growth spurt probably put more pressure on her tummy. Your comments definitely got me thinking about what reflux/gas and how we might work on things. She has calmed down & is sleeping more, but there's still some rough cycles to work through. If we encounter more issues, I'll ask you. Thank you for the help! I would try giving her gripe water and/or gas drops. I did gas drops after every feeding and gripe water before every nap for brinley. Good luck! Hi, I know this is an old post but I need help. My 6 week old doesn't nap well at home. She will nap a full 1.5/2 hours in her car seat on a walk or out and about. She will also sleep for 4-5 hour stretches at night, but when we are home I have to rock her and shush her before putting her in her bassinet only to have her wake 30 minutes later. I assume it's the 45 min intruder but why does it only effect her during the day in her bassinet? Am I over/under stimulating her before her nap time. Should I let her cry when she wakes early? Any help would be so appreciated.